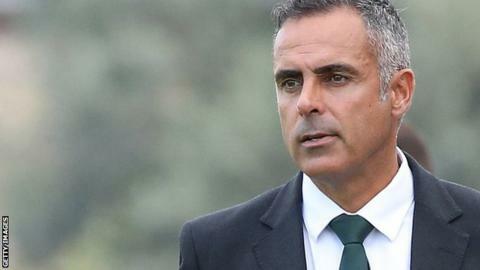 Championship strugglers Reading have appointed Rio Ave boss Jose Gomes as their new manager. The 48-year-old has replaced Paul Clement, who was sacked on 6 December. A former assistant manager of FC Porto and Spanish side Malaga, he also had spells coaching in Saudi Arabia and won the Saudi Super Cup in 2016 with Al Ahli. Reading are 21st in the Championship and outside the relegation zone on goal difference. Later on Saturday, the Berkshire club confirmed that coaches Nigel Gibbs and Dave Beasant have joined Karl Halabi in leaving the Madejski Stadium, following Gomes' arrival. "I am confident in this project," said Gomes, who leaves Rio Ave with the club eighth in Portugal's Primeira Liga. "I know how the club and the fans around the club feel the results, so I am here to help and to put our club in the right place. "The Championship is the most competitive league in the world. Before the start of the season, about 20 of the teams want to go to the Premier League. "It will be a very difficult mission but I am completely sure that we will achieve what we want." Gomes watched Reading lose narrowly 1-0 at home to promotion-chasing Middlesbrough on Saturday and said he was impressed with the Royals' display. He told BBC Radio Berkshire: "Middlesbrough, they were in sixth position, now in fourth, and if you look seriously at the match, the [Reading] players deserved to win this match in my opinion. "We need to give them confidence and I'm sure they will like my ideas and my footballing philosophy. "All the coaches in the world, they dream to work in English football, so I am completely excited with this project." Gomes' first game in charge will be at fellow strugglers Millwall on Wednesday. Can Reading find stability under Gomes? Since their relegation from the top flight in 2013, Reading have endured more bottom-half finishes in the Championship than promotion bids. Having narrowly missed out on a return to the Premier League when they lost the 2016-17 play-off final to Huddersfield Town on penalties under Jaap Stam, they have subsequently struggled. The Royals finished third that season, missing out on a top-two spot by eight points, but achieved 41 fewer points the following season. They finished 20th in 2017-18, just three points above the relegation zone. That came after Dutchman Stam left in March, before an ultimately disappointing nine-month period under former Derby County and Swansea City boss Clement's management. Clement helped the Berkshire club avoid dropping into League One on the final day of last season, but won only four of his 20 matches in charge this term before his departure. Reading chief executive Nigel Howe said of Gomes' appointment: "We have been able to secure the services of a manager with a very impressive reputation in his native Portugal. "He brings new energy, excitement and impetus to Reading and, importantly, he boasts a reputation of creating winning teams with an exciting brand of football."